“Bloody Bandicoots!” my friend shouted as we screeched to a halt in the early evening pitch black darkness somewhere between Kuranda and Mareeba in Far Northern Queensland. “Bloody bandi-whats?” I asked. A few moments of recovery and a quick explanation later, we were on our way again, this time nervously looking out for naughty eyes reflected in our headlights. Hidden away up the range behind Cairns, the Atherton Tablelands is a collection of villages and settlements set amidst agricultural land. Atherton, Tolga and Mareeba are places to get away from things, or life in noisy Cairns anyway. It is cooler up at the Tablelands than down on the coast, offering welcome relief from the sometime overwhelming heat. The tablelands comprise a handful of villages, the most central of which are Atherton, Tolga and Yungaburra. Each town has a lot to offer by way of local scenery and fresh local produce. Atherton is the largest settlement and as well as having the only supermarket, also has an attraction called the Crystal Caves, where it is possible to mine your own gemstone in the tunnels beneath the main street. Gems found here include rose quartz and blue topaz. Tolga has a great little country pub with strangely out-of-place-looking neon blue strip lighting outside and tasty food inside. 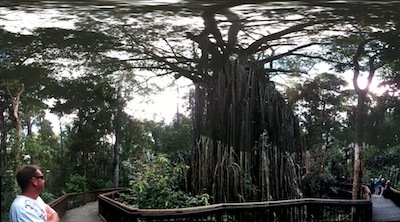 The Curtain Fig Tree (otherwise known as the Atherton fig tree) is near Yungaburra and definitely worth a visit. It is a fantastic and enormous tree, over 500 years old, with roots growing seemingly everywhere and forming a sort of curtain. It looks weird and like a special effect from a movie. We spotted a possum in the nearby foliage and chuckled when we overheard some other tourists discussing whether or not it was a kangaroo! Far from simply being about food though, the Atherton Tablelands is heaven for watersports enthusiasts. Initially, feeling a significant distance from the sea, I was surprised by the number of local drivers with kayaks on their car roofs, or towing small boats, but then I remembered the Tableland lakes. There are three lakes, Tinaroo, Eacham and Barrine. Each has beautifully clear water and contains no crocodiles (an important consideration in this part of the world.) It was a bit cool for swimming when we visited (mid winter) but on a hot summer’s day, I can imagine nothing more refreshing than a cooling dip in one of the lakes. Only one hour’s drive from Cairns, the Atherton Tablelands are another world, but still easily reached, offering a refreshingly slower pace of life, than that down by the coast. The area is definitely worth a visit for a convenient peek at Australian country living, but also for all of the yummy local produce. Just watch out for the sneaky bandicoots!